Congratulations to the 2016 Teal & Silver Award recipients. Chandler-Gilbert Community College recognized 10 winners during a breakfast event at the Pecos Campus for their efforts and support of CGCC students, employees, programs, services and the college community on May 10, 2016. 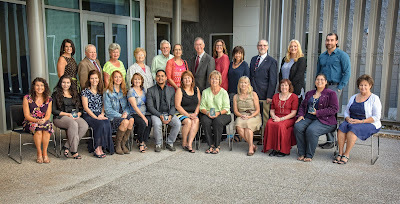 The Chandler-Gilbert Community College Teal & Silver Awards Program was created by former president, Dr. Maria Hesse, to recognize the contributions of individuals who support Chandler-Gilbert Community College through various efforts. This year's recipients positively impact the college by assisting with the program or service improvements, supporting creative and innovative ideas, improving the quality of the college experience, support the delivery of instruction, providing resources or assisting with cost-saving measures and advocating for the college in media, with elected officials and the in the community.